Note: Use glue wherever needed when attaching parts. If clay doesn't stick to itself....glue it! 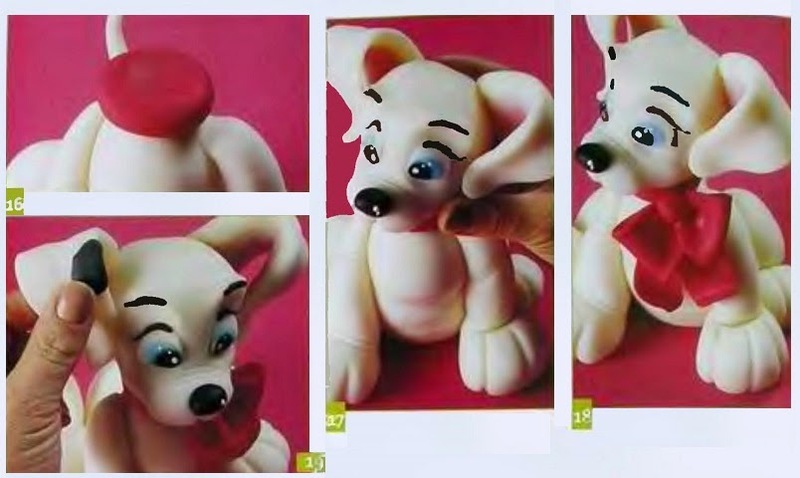 Cover the smaller Styrofoam ball with white clay.. With your fingers, flatten nose area and divide muzzle with clay knife. [see final image] Mark indentations to place the eyes and the nose with a ball-end clay tool or stylus. Note: If you are using polymer clay for this project, please be warned that you should NEVER put Styrofoam in an oven. Use a tin foil or wooden ball instead of foam ball. Make 2 teardrop shapes of white clay for base of eyes. Prepare 2 teardrop shapes of sky blue that is a little smaller than previous (these are for iris) and 2 teardrops of black clay that are even smaller (for pupils). Stack them as shown in the photo. Place the assembled eyes aside for now and let dry. With black clay, make 2 small rolls for eyebrows and 2 for eyelashes. 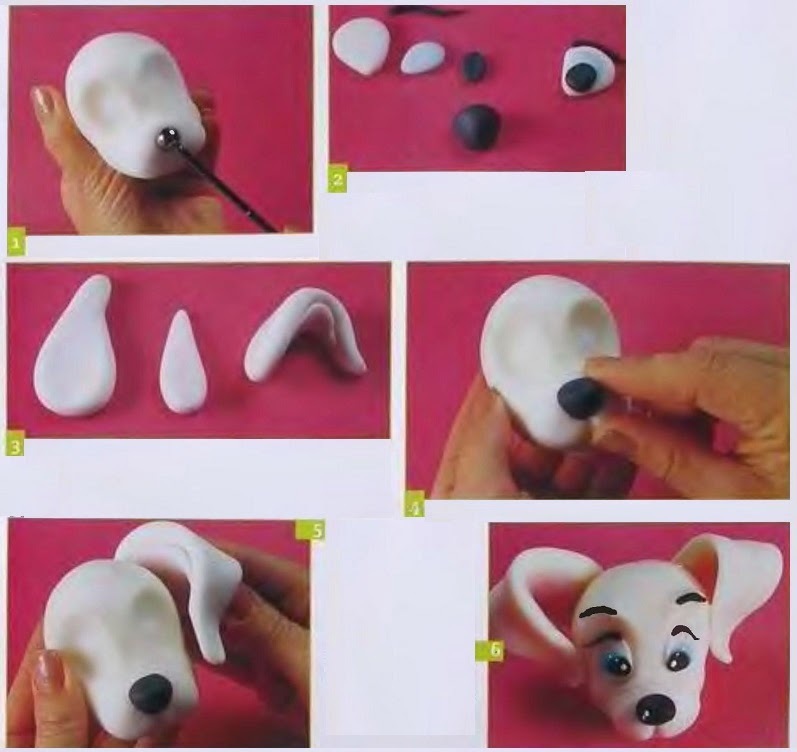 Make 2 teardrop shapes of white clay and flatten them for ears. For inner ear, make 2 teardrops of pink clay that are a little smaller than the ear shapes and flatten them. Combine these inner pieces with the ear pieces. Place the nose on the face. Use glue if needed. Position the ears on the head. Stick the previously created eyes in place. Add the eyebrows and eyelashes. Paint eye highlights with dots of white acrylic paint. Cover the larger Styrofoam ball with abundant clay (white). Continue modeling until a truncated cone shape is obtained. With more white clay, make 2 rolls that are wide at one end but narrow at the other. Bend the wide end into paws. Mark the toes and the wrinkles with the sculpting tool (knife tool); smooth the edges. Prepare 2 short, thick rolls of white clay and flatten them slightly. Mark the toes and wrinkles with the sculpting tool and smooth edges. With the same white color, create 2 oval shapes for thighs. Flatten them slightly. For the tail, make a long thin roll that tapers to point. Place the front legs on the body. Use glue if necessary. Place hind paws next to hips. Attach the thighs above paws so that puppy is in sitting position. Place the tail on back of hip. Prepare a bow using separate pieces of red clay. Two bow shapes plus 1 center and 2 ribbon tails as shown in pattern. Model a ball of the same red color and flatten it. This will go around neck. Position the circular red piece on top of the body. Insert a wood stick into body to support head, leaving an inch or so sticking out in center of circular red piece. Be sure to use a kebab stick (or something similar) to assure head will stay in place. Apply a little glue on the stick when inserting it. Attach the head on top, securing it over stick. Assemble the bow pieces on the neck as shown in photo. 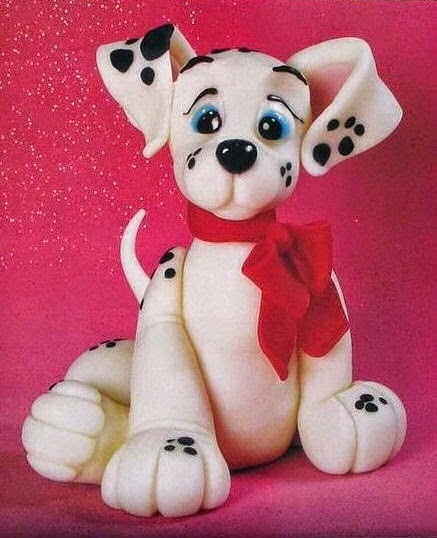 To complete, shape several dots (flattened ovals) of black clay and distribute them over the body, simulating the spots on a Dalmatian dog. What a great tutorial. I just stumbled on your blog while looking for some information on air-dray clays, and am so excited to find you.